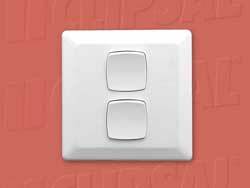 – 2 Gang Switch White, 250V 10A ac Only. – Suitable for Standard Mounting accessories. Our premium quality Clipsal P2000 2 Gang Switch White, P2032/2VA products will cater to your emergency and daily requirements. Our products include exit and emergency luminaries, Clipsal P2000 2 Gang Switch White, P2032/2VA, weatherproof emergency lights, low-temperature emergency lights and much more. As the best Clipsal P2000 2 Gang Switch White, P2032/2VA supplier Australia, we assure that our products never let you down. Our weatherproof emergency lights and low-temperature lights that work for a long time and requires very low maintenance. We are the perfect match for both exterior and interior emergency lighting solution. Our affordable rates, great manufacturing designs, and quality will surely make your requirements fulfilled. We guarantee our customers that AGM will serve the best in the Clipsal P2000 2 Gang Switch White, P2032/2VA market which you truly deserve.